Editor’s note: Mike Ford (’72) recently retired from Wake Forest after 36 years as a student life administrator and campus leader. He shared this farewell message on June 28, 2017, at a reception in his honor. 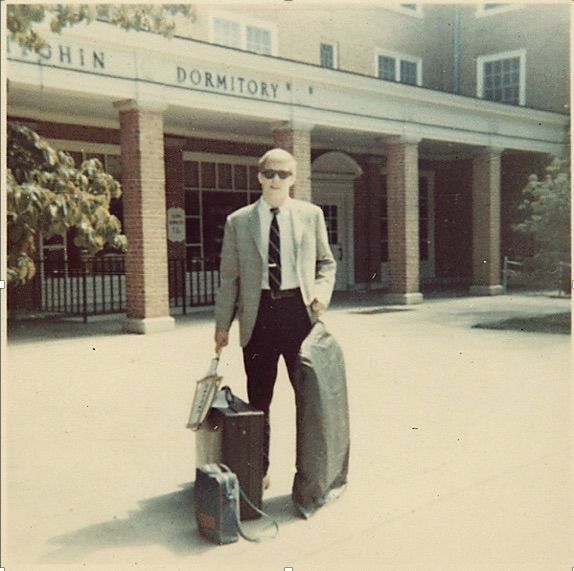 So I matriculated into Wake Forest as a freshman student in the fall of 1968. That is how new students showed up for college 50 years ago. I was assigned my room, 207B, in the Kitchin Residence Hall. Clarence Maynard Beach Jr. from Eden, North Carolina, was my roommate. Clarence was a very nice guy and very smart and studious. He also was very respectful of my half space in our very small, hot dorm room (that’s right, no air conditioning). My only disappointment was that Clarence was a senior. How did I get stuck with a senior for a roommate when all of my other new student classmates had freshmen roommates? I was greatly annoyed by this roommate match until late in the semester as final exams approached and the academic air I was breathing got a little thin. It was then my appreciation for and my friendship with Clarence grew enormously as he tutored me through my first set of college exams and classes. Thank you, Clarence! And so it was that Mike Ford’s love story with Wake Forest began. Mike Ford as a freshman in 1968. My four undergraduate years at Wake were filled with many wonderful memories as well as my share of personal challenges. A large student rally and march on President Scales’ house to call for the cancellation of classes so that we could hold campuswide events to protest the U.S. involvement in the Viet Nam War. I would not consider myself to be a political activist at the time, but I wanted to be where the action was. Cheering on the Deacon Football team as they won the 1970 ACC Championship. GO DEACS! Tubing down the Yadkin River with some of my fellow students and a raft full of cold beverages in tow. I will leave the rest to your imagination … remember the drinking age was 18. Receiving back my fraternity lavalier from my college sweetheart at my graduation when she let me know that she had another year of Wake Forest to enjoy. More on that later. 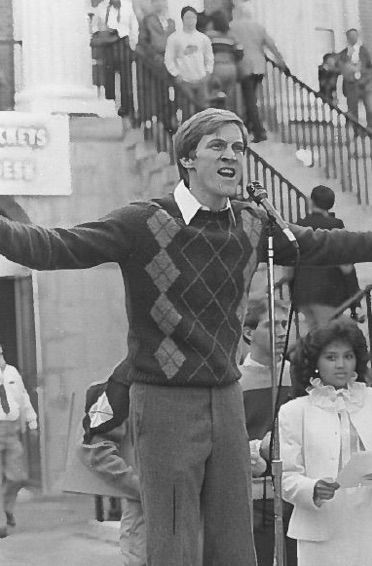 Ford speaks at a campus rally. And I will always remember sitting at the feet of some challenging and inspiring professors … Dr. Jack Fleer (politics), Dr. David Smiley (history), Dr. Greg Pritchard (philosophy), Dr. Mac Bryan (religion), and then there was Dr. Elton Cocke, professor and chair of the biology department. He was a real tough, old-school teacher. But because I faithfully made it to the 8 a.m. Tues. Thurs. and Saturday classes each week, Dr. Cocke gave me a “Gentleman’s C” for the class. Never as a student did I darken the doors of the science buildings again. While I loved most of my professors and classes, much of my formative Wake Forest experience was shaped by my high level of involvement in the realm of Campus Life. I was fortunate to move through the student leadership ranks of Student Government, the College Union (now the Student Union), my fraternity Sigma Chi and, of course, College Republicans. And it was during this period of time I had the very good fortune of marrying my former fraternity lavalier sweetheart, Gayle Brumbaugh (’73), and we started our family of three girls with the arrival of our first daughter, Sarah. All of these significant life events had prepared Mike Ford to launch his work as the Director of Student Activities and the College Union. I was welcomed back to Wake by some wonderful professional colleagues and mentors: Dean of Men Mark Reece; Dean of Women Lu Leake; University Chaplain Ed Christman; Chair of New Student Orientation/Lower Division Advising Committee and Chair of Mathematics Dr. Marcellus Waddill; and Professor of English Dr. Ed Wilson. Throughout my professional journey at Wake, in addition to working with our remarkable students, I have had the great privilege of working alongside of many outstanding faculty and staff colleagues … many of you are in this room. You have taught me the ropes of student development theory and practice, you have mentored me, challenged me, encouraged me, and partnered with me along the way. We have created new program models and student initiatives together … we have faced and worked through student crises together … we have overcome seemingly insurmountable obstacles together. We have laughed together … we have cried together. 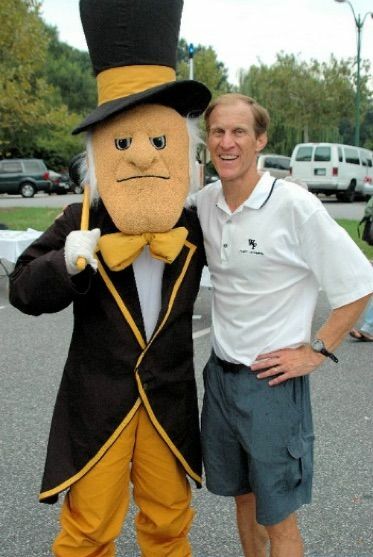 We have cheered on our Demon Deacons together through the good years and the bad. We have shared our lives together as professionals and as friends … bound together by the common purpose of enhancing the lives and the learning of our students while promoting their personal growth and well-being in the spirit of Pro Humanitate. 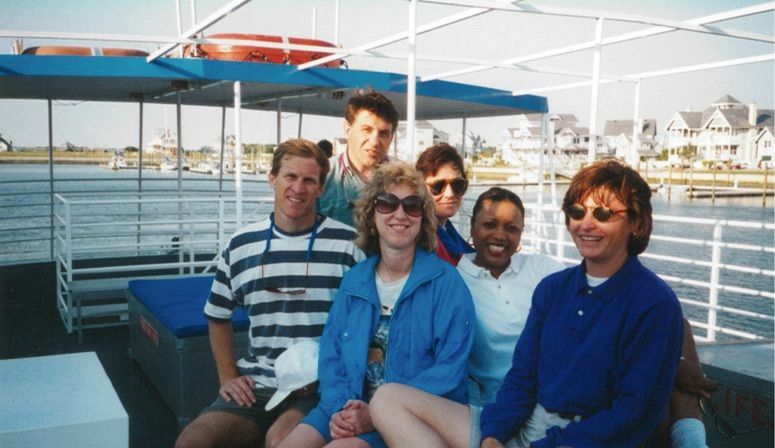 Back in the day: Mike Ford (striped shirt) with student life administrators including Ken Zick (standing), Marianne Schubert (blue jacket), Regina Lawson (far right) and Barbee Myers Oakes (white shirt). I want to acknowledge and thank several colleagues with whom I have shared some meaningful time and experiences. As many of you know, I love Wake Forest sports so I am going to use the Metaphor of a Basketball Team. Ken Zick: I would call Ken my Teaching Coach. 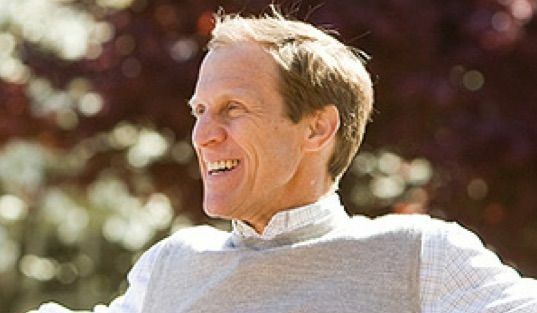 Thank you Ken for teaching me how to put our Student Affairs work in the context of the broader mission and purpose of Wake Forest, especially connecting student learning and development to our liberal arts tradition. Harold Holmes: I would consider Harold to be my Game Coach, as he provided me valuable advice, feedback, and encouragement throughout our day-to-day engagement with students. Harold, thank you for teaching me how to work with some of our more challenging students and holding them accountable through tough love. 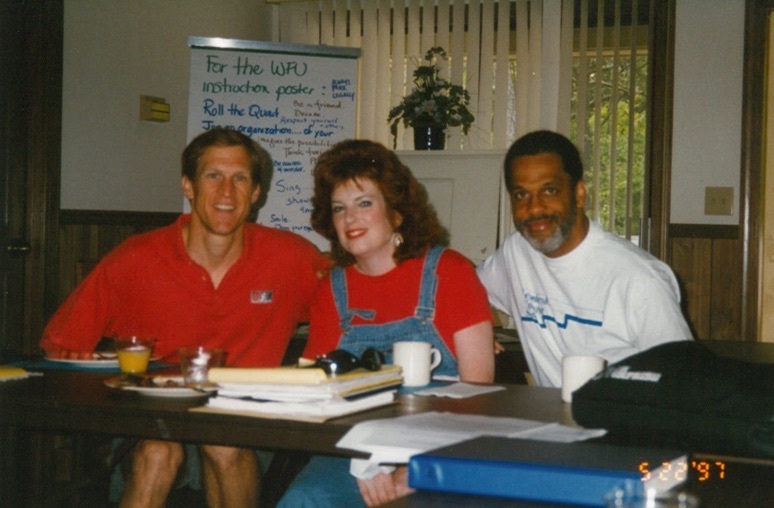 Mary Gerardy: Mary was my “On the court Team Captain” who I played and served alongside of for many years. Mary, thank you for showing me how to engage, serve, and love all of our students, whatever may be their socioeconomic background, ethnicity, or gender identity, as well as how to work through disappointments and setbacks while staying true to one’s values. Penny Rue: Penny has been my Locker Room Coach, working with me “off the court” to help me perform my best when I am in the Game. Penny, thank you for teaching me (through word and example) what it means to be a true Student Affairs professional in all dimensions: With our head, through continuous learning and personal development … With our Heart, through always putting ourselves in another person’s shoes and seeing the world from their perspective … And With our Body, through taking courageous action, showing up to support our students and staff, and following through on our promises. Tim Auman: Tim has been my Team Chaplain and Personal Chaplain. Thank you Tim, for showing me, as a fellow Christian, how to cultivate a spirit of understanding and acceptance for our interfaith friends as well as demonstrating the love and pastoral care for those among us who are in crisis or in need. Melissa Harris-Perry: Melissa has been my Prophetic Coach who always pushed me to see the Game in a new and different way. Thank you Melissa, for challenging me to grow and act upon a new understanding of the real human life issues around racial and gender equity and social justice for the marginalized and powerless in our society. And finally, Kelly Larrimore: Kelly has been my Trainer and Head Cheerleader for the Game. Many people will tell you that the Trainer is the most important member of the Team, because the Trainer gets the players in shape and mentally tough for the Game. 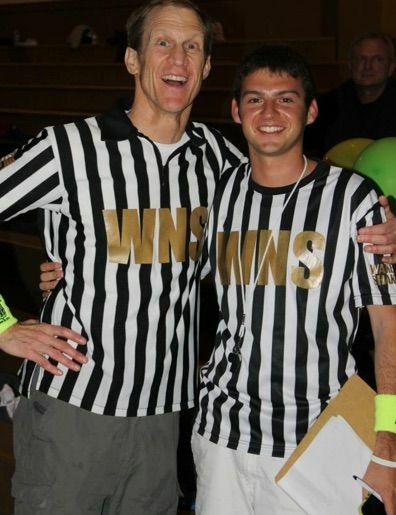 Kelly, for the past nine years you have been my dear friend and Wake Forest colleague through thick and thin. Whatever successes we have achieved with our student development initiatives and Pro Humanitate programs are in large measure due to your faithful and exemplary work. You are a great light of joy and encouragement to our students as you have been to me. I will be forever grateful. I would also like to give a shout out to all of my Pro Humanitate Institute colleagues. We have shared a great two years together, and we have done some wonderful work to advance the spirit of Pro Humanitate across our campus, community and beyond. Thank you, PHI friends. So all my time at Wake Forest would not have been as much fun or nearly as memorable or rewarding without my family. I am grateful to have my in-laws here today (Joy and Woody Baldwin and Wayne and Jane Brumbaugh). They are all Wake Forest alums and big fans, and they have followed and supported my career at the university. They will also tell you about some of my many flaws … such as my hyper-competiveness at times (especially with family games), my challenge with punctuality, and my long-winded prayers before meals. Can I get an AMEN family?! Thank you for your kindness, love and support. Two of my three daughters are here, Bekah and Hannah and their families. Sarah and her husband Blake and their four kids will arrive next week for the annual Ford Family Beach Trip. Oh yeah! Gayle and I spent our first 7.5 years in Winston-Salem living on Faculty Drive so our three girls got a deep dose of the Wake Forest culture and spirit early on in their lives. Learning to ride their bikes on the Quad, Lemonade Stands for the arriving new students, Birthday Party Scavenger Hunts all around campus and lots of WF Athletic events … the Ford girls were here, there, and everywhere while swimming in the Wake Forest milieu. Each of my girls broke my heart a little bit … as well as our bank account … when they decided not to attend Wake Forest, but rather chose to go away to college. 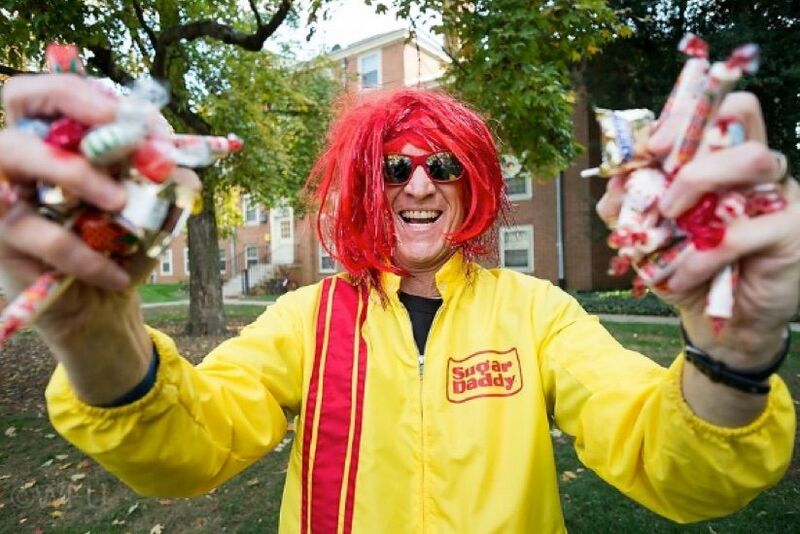 I get it, it is hard to go to a college where your father keeps showing up on campus. 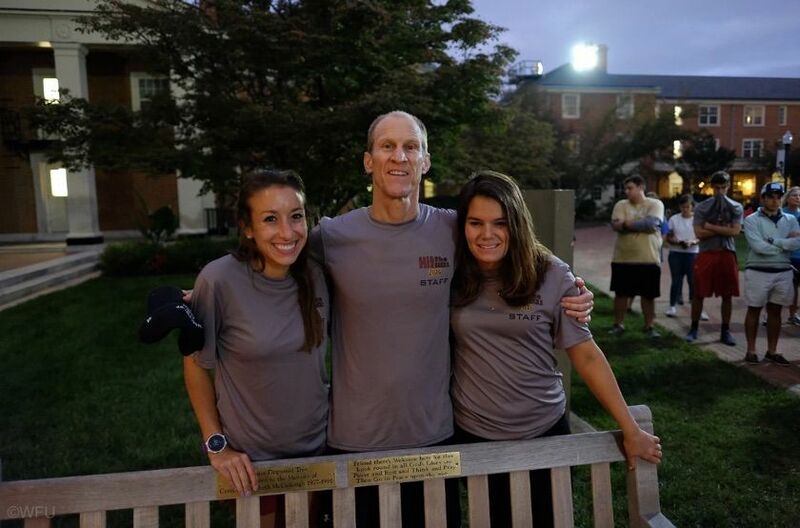 Yet through the years Sarah, Bekah, and Hannah have kept a strong affection and spirit for Wake Forest. Thank you Sarah, Bekah, Hannah for your love and support for me and my career at Wake. Now I am working on getting my grandkids to come to Wake Forest for college … Ever, Owen, Luke, and August … How is Big Dad doing with that? Gayle … It is hard for me to put in words all that you have given me through my career journey these past 36 years at Wake. I know that I have taken advantage of your love, your patience, and your good will, as I have lived out my passion for all things Wake Forest, especially my work with the students at all hours of the day and night. I have many regrets, and I know today that I would do it differently if I could go back and do it again. Gayle, apart from my relationship with God, you are my greatest love, and I am so grateful to have you in my life for the past 47 years and going forward. Thank you so much, and I Love You! 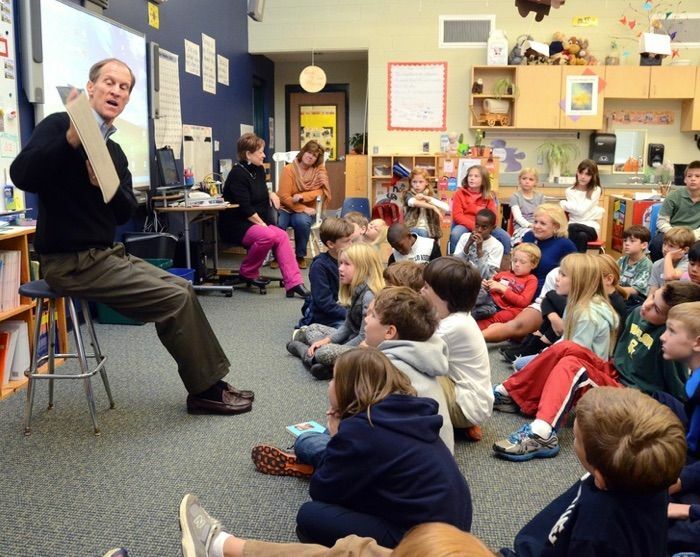 As I reflect back over my 36 years at Wake Forest, my student-facing work has taken many twists and turns and in the process found many forms and expressions … But one thing has always been a constant for me. 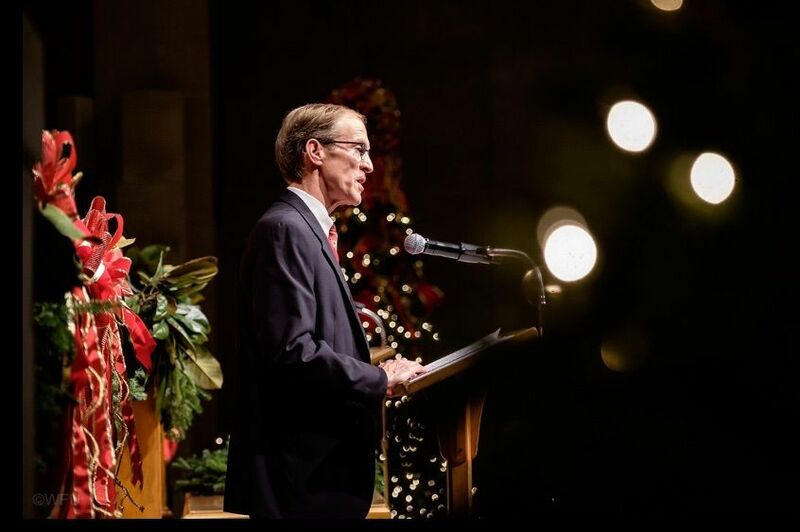 I have always felt that my time at Wake Forest has been a calling … God’s calling on my life. I have come to believe and know that I owe my whole life to God … where He has placed me in His world … what He has given me by way of intellect, personality, curiosity, and passions … who He has placed in my life as significant people, starting with my family … and most importantly how He has redeemed my broken and messy life through His love for me in His Son, Jesus Christ. Several years ago I was introduced to a book by Dr. Steven Garber entitled “Visions of Vocation: Common Grace for the Common Good.” In his book Steve lays out his understanding of vocation as a calling from God. A calling to see and to know the world in all of its beauty and brokenness, and to choose to love the world even in its wounds, especially in its wounds, whether they be in family or friendship, psychological or sociological, in economic life or political life, in the arts or in education, in our local communities or in distant countries. Steve goes on in his book to share stories of men and women like you and me who have chosen to incarnate the reality that we can truly know and still love the world in all of its pain and sorrow. Garber writes: “The poet Bob Dylan once sang, ‘Everything is broken.’ Yes, everything, and so we must not be romantics. We cannot afford to be, just as we cannot afford to be stoics or cynics either. And for Mike Ford’s life calling, there have been college students … yes, many college students to teach, guide, and mentor. And what a wonderful calling it has been! Thank you all for sharing this journey with me. God bless you, and God bless Wake Forest!